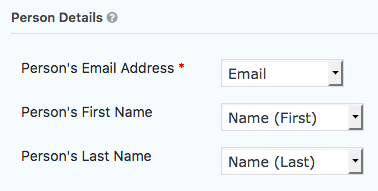 If you have a form that is collecting a name and email address, we can use that information to match them up with an individual in Church Community Builder. This will allow us to add them to an event, group, or process queue. Go to the CCBPress section of your form settings. Click on the Add New button to create a new feed. Select a destination. Either an Event, Group, or Process Queue. Choose or search for a specific destination in the next dropdown field. Choose the appropriate form fields that correspond with the person’s information in Church Community Builder. This allows us to find a match in CCB. Otherwise, we will create a new person. This last step is optional. Here, you can configure this feed to conditionally execute based on fields in your form. This allows you to setup multiple feeds on that same form that only execute if a specific condition is met.